To expose the tools from ArcGIS GeoAnalytics Server to members of your portal, complete the Steps to set up ArcGIS GeoAnalytics Server section. GeoAnalytics Tools and analysis capabilities are available to members in your organization through the portal's Map Viewer, ArcGIS Pro, the ArcGIS API for Python, or the ArcGIS REST API. To learn more about the differences between the ArcGIS GeoAnalytics Server toolset for feature analysis and the standard spatial analysis tools, see Standard and GeoAnalytics Tools feature analysis comparison and Feature analysis tool differences. To learn how to use the tools, see Perform big data analysis using ArcGIS GeoAnalytics Server or refer to the ArcGIS Pro help. Review the information in Best practices for planning, configuring and modifying your GeoAnalytics Server to understand how you'll architect your system for GeoAnalytics Server. The GeoAnalytics Tools are hosted as a series of tasks in ArcGIS GeoAnalytics Server. For members of your organization to use these tasks to perform analysis in ArcGIS Enterprise, you'll need to set up a base ArcGIS Enterprise deployment, if you do not already have one; GeoAnalytics Server; and a spatiotemporal ArcGIS Data Store. 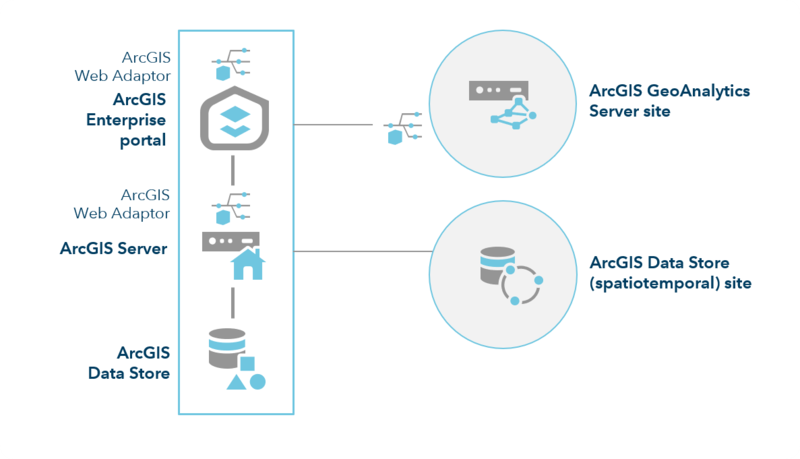 You'll need two ArcGIS Server sites—one for the portal's hosting server in the base ArcGIS Enterprise deployment and one to act as the GeoAnalytics Server. A conceptual model of a one-machine GeoAnalytics Server site configuration. The one-machine server site is federated with an ArcGIS Enterprise portal (which is part of the base deployment). ArcGIS Data Store is installed on one machine, set as the spatiotemporal type, and configured with the hosting server (which is also part of the base deployment). A conceptual model of a three-machine GeoAnalytics Server site configuration. The three-machine server site is federated with an ArcGIS Enterprise portal (which is part of the base deployment). ArcGIS Data Store is installed on three machines, set as the spatiotemporal type, and configured with the hosting server (which is also part of the base deployment). An ArcGIS Server site licensed as the GIS server and set as your portal's hosting server. Two installations of ArcGIS Web Adaptor—one configured with the portal and one configured with the GIS server. At least two installations of ArcGIS Data Store—one configured as a relational data store and one configured as a spatiotemporal big data store. You should deploy the spatiotemporal big data store on a different machine than any of the other ArcGIS Enterprise components. You can include multiple machines in the spatiotemporal big data store. 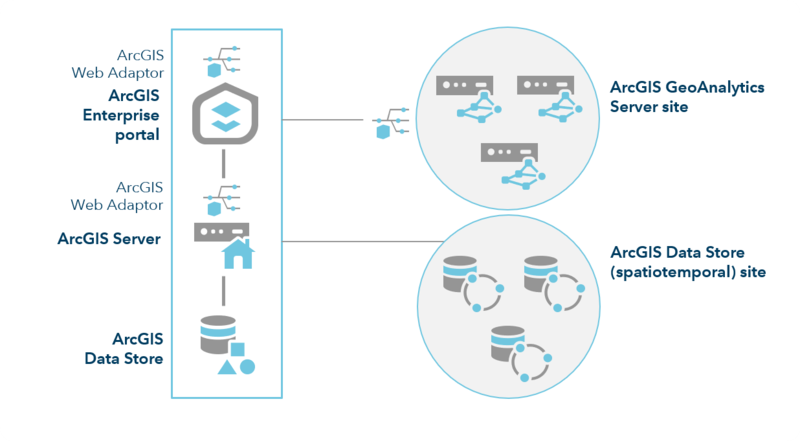 See Additional server deployment for details on site architecture recommendations. An ArcGIS Server site licensed as ArcGIS GeoAnalytics Server and configured using the steps below. Install ArcGIS Data Store and create a spatiotemporal big data store that you register with your base deployment's hosting server (Site 1). Install a second ArcGIS Server site (Site 2) with one or three-machines. License this ArcGIS Server site as the GeoAnalytics Server. Install an additional instance of ArcGIS Web Adaptor and register it with the second ArcGIS Server site. Ensure the following required ports are open in your system for intermachine communications. GeoAnalytics Server uses ports 2181, 2182, 2190, 56540-56545, and 7077; spatiotemporal big data stores use ports 9220 and 9320; and the relational ArcGIS Data Store uses port 9876. Sign in to the portal as a member with administrative privileges. The URL is in the format https://webadaptorhost.domain.com/<webadaptorname>/home. Browse to Organization > Settings > Servers. Federate your GeoAnalytics Server site with your portal. On the Servers page, in the drop-down menu under the Feature Analysis - GeoAnalytics Tools heading, choose your GeoAnalytics Server. Configure the GeoAnalytics settings for your deployment to ensure resources are allocated appropriately to the GeoAnalytics Tools. Grant members privileges to perform analysis. Publisher and spatial analysis privileges are needed to use GeoAnalytics Tools. Once the changes have been saved, members of your portal can browse to the tools in ArcGIS Pro or Map Viewer, and can use the tools in ArcGIS API for Python and the ArcGIS REST API. See Use the GeoAnalytics Tools for more information about using the tools in Map Viewer, including data sources that can be used in the tools.